In a world in which we are shelled from every angle with shiny, slick, modern technologies, I think we, as humans, begin to harken back to simpler times. Nostalgia – an age where we, as a people controlled our own destinies and created the things around us with our own hands and the sweat of our brows. That being said, I am constistantly seeing a recurring theme popping up around me – from the local coffee shop’s sidewalk boards, to West Elm’s holiday catalog, your local trendy watering hole, and yes – even Starbuck’s yesterday. 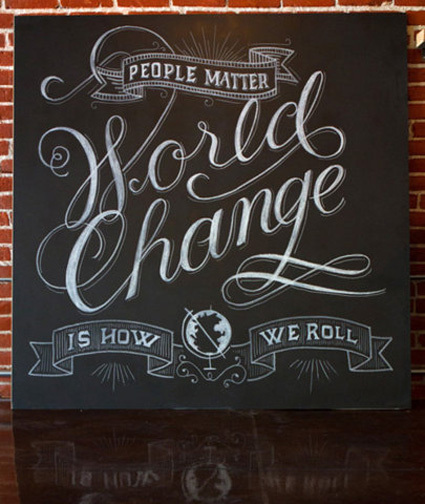 Hand-drawn lettering. The origins of modern computer driven typography. Artisans like Alan Arial (who caries the moniker “Alphabet Guy”), and Atlanta’s own, Chris Yoon, have taken up the quest like a blacksmith’s apprentice turned master. The trend has taken on another turn in fashion as another way to push a growing vintage Americana trend, with Brooklyn artist Jon Contino receiving accolades for his involvement in the men’s lines CXXVI and Barnaby Black, as well as his own illustrations (www.joncontino.com). follow all the above mentioned artists and show some support for their craft!